State regulators are now investigating two major California utilities, PG&E and Southern California Edison, for their possible roles in the Camp and Woolsey Fires. The causes of the fires burning in California are under investigation. But, Southern California Edison reported a “disturbance” at one of their substations, two minutes before Cal Fire says the Woolsey Fire started nearby. And 15 minutes before the deadly Camp Fire started in Butte County, PG&E detected a transmission line outage near the fire’s origin. State Senator Jerry Hill has been a critic of PG&E ever since the 2010 San Bruno explosion in his district. “They have positioned it that they are too big to fail, I frankly think they’re too big to succeed, that’s why we need to take a closer look at PG&E,” said Hill who is traveling and spoke to ABC7 via Facetime Monday. Hill says he’s looking into legislation that would break up PG&E, one of largest utilities in the United States. “Its possible that PG&E will try to raise rates,” said Mindy Spatt who works for TURN, The Utility Reform Network, a nonprofit that advocates for low utility rates. 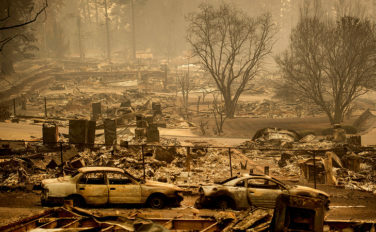 Investigations are ongoing, but even faced with the possibility of responsibility for last year’s North Bay fires and billions in damages, PG&E was talking bankruptcy. “I think we can expect that PG&E will once again be saying we can’t afford this. Well, customers can’t afford it either,” said Spatt. In a statement, PG&E says they gave the California Public Utilities Commission an Incident Report and will cooperate with any investigations. “Our hearts are with the communities impacted by the Camp Fire. The loss of life and property is staggering. Right now, our entire company is focused on supporting first responders and assisting our customers and communities impacted by the Camp Fire. We encourage the public to follow their directions and warnings as fire conditions continue to change. The cause of the Camp Fire has not yet been determined. In a separate statement, PG&E says in part that they did not cut power to Butte County last week because, “the forecasted conditions didn’t meet the criteria to initiate a Public Safety Power Shutoff.” But on October 14th, PG&E cut power to parts of the North Bay amid red flag conditions to prevent a fire. And last week in Butte County, the Sacramento Weather Service says there was a red flag warning for the Sacramento Valley, which includes Butte County, starting on Tuesday, which was two days before the Camp Fire started. “The Camp Fire did not start in any of the fire index areas as part of the Tuesday (Nov. 6) Public Safety Power Shutoff notification. In addition, 115kV transmission lines are not currently part of the Public Safety Power Shutoff program due to a variety of safety and regulatory factors. There are a series of factors that PG&E considers when deciding to initiate a Public Safety Power Shutoff. These include strong winds, very low humidity levels, critically dry vegetation and on-the-ground observations by our crews.